Hello, my name is Stephanie Williams. I’m 34 years old, from Texas and married with one child. I’ve always struggled with being overweight. 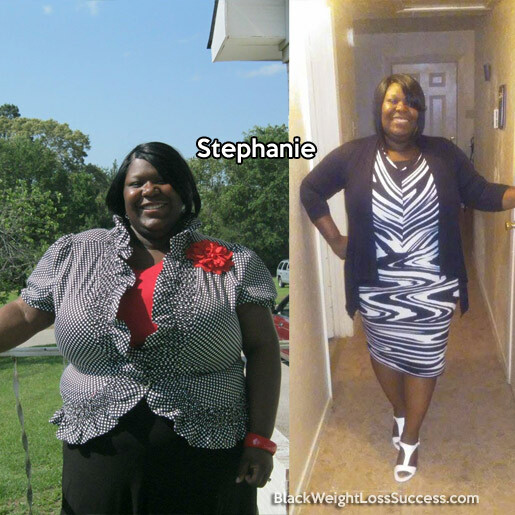 My starting weight was 303 pounds and I now weigh 273 pounds (height: 5’3″). That’s a total loss of 30 pounds. Listen, I tried many diets and would do well for about a month. Then, I would fall back into bad eating habits. My wake up call came in March 2015. My body began to send me signals that something was terribly wrong. My blood pressure would be really high, which made me have many sleepless nights and no energy. My wake up call was seeing a picture that I posted of myself and a close friend. It was when I really saw myself for the first time. I was embarrassed and guilty. I had allowed myself to get to this point. That very next day I decided to JUST START! I bought cases of water and got rid of soda. Now, I’ve been soda free for 5 months. I went to the store and got lot of fresh veggies and fruits. I gave up frying my foods and changed to baking, grilling and boiling my food. I only use olive oil while cooking. I ate less fast foods and prepared more food at home to monitor my salt intake. I have fallen in love with Mrs. Dash seasoning. I walk at least three times out the week with workout to videos on Youtube. Leslie Samsone is one of my favorites. I also mow the lawn for exercise. I feel and look so much better now. My weight has dropped and my blood pressure has lowered. One of my biggest motivations is God. Philippians 4:13: “I can do all things through Christ which strengthens me.” He truly gives me the push I need from day to day. By me sharing my journey, I have encouraged so many women to JUST START. I’ve had an opportunity to share my journey on a radio talk show as well. I’m so grateful for the new and improved me.